Unfortunately the knit bunny is still not done. Time is precious and in short supply. Every year my Mom and her boyfriend set up at an antique engine show/flea market in Zolfo Springs, Florida. I drive up and visit every year. Usually I walk through the show and flea market looking for odds and ends. Two years earlier I was looking for a spinning wheel and found one on the drive home at an antique store. Unfortunately it was missing quite a few pieces and it never did work. However, it inspired research and knowledge of spinning that I am still gathering. This year I brought my very own Kromski Sonata spinning wheel. In the beginning, I set it up behind the tables of stuff for sale and people were coming right up to the tables and watching me. I had a man who owned alpacas in North Carolina tell me they spin the fibers all the time and he has fiber for sale as high as $130 an ounce. I also had a mechanical engineer come up to me and just watch analyzing the movements from the treadle on up. The best part of the experience was when two young children who didn’t speak English came up to me. First they were standing back, fascinated. Some one guided them closer and I pulled out the bunch of wool roving from my bag and had them touch it. Then I tore off small bits of drafted fiber which is looser and easier to spin. Finally I pointed to my handmade niddy noddy with the twisted yarn. I can only hope that some day they’ll remember the day they saw the lady using the spinning wheel and will try their hands at crafts themselves. Two weeks have gone by and I haven’t knit a thing. My newest issue of Interweave Knits is sitting on the kitchen table waiting for me for a little over two weeks. Time is precious and in short supply. I was hoping to knit a rabbit stuffed animal for my mother’s boyfriend’s birthday. He talks about the neighborhood bunnies like they are his friends but I have less than two weeks before I see him. I think I might try to make mini-bunnies from a library book instead but I’m still not sure about time. The full size rabbit stuffed animal is so cute though! 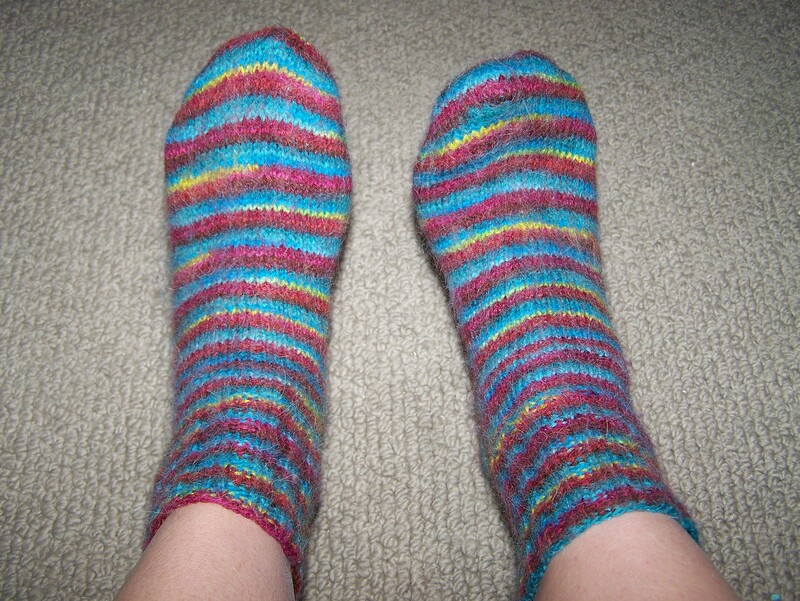 There is a definite difference in my mood between being able to knit and not having enough time. Crafting activities are great stress relievers. As of now, I am not getting any relief from this stress! Hopefully I’ll have more to post soon. 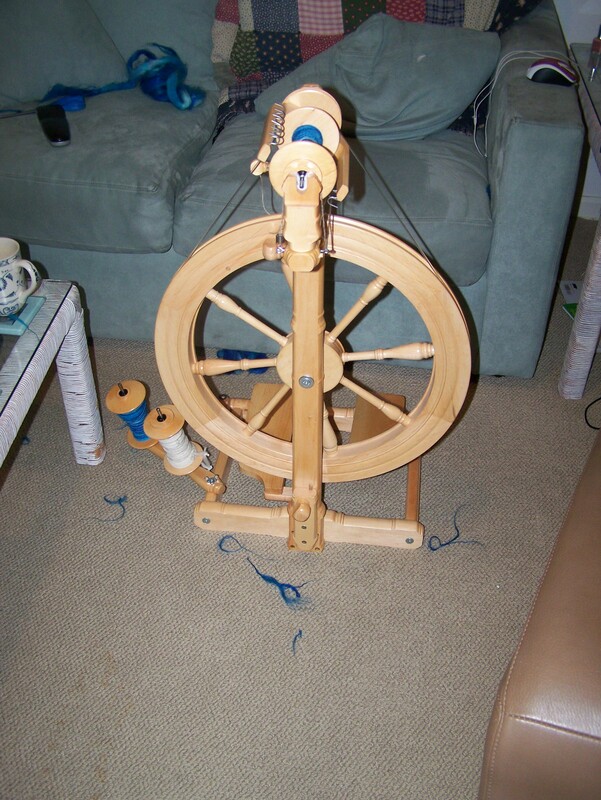 For anyone who begins spinning, you will soon realize that you need more tools than just a spinning wheel. 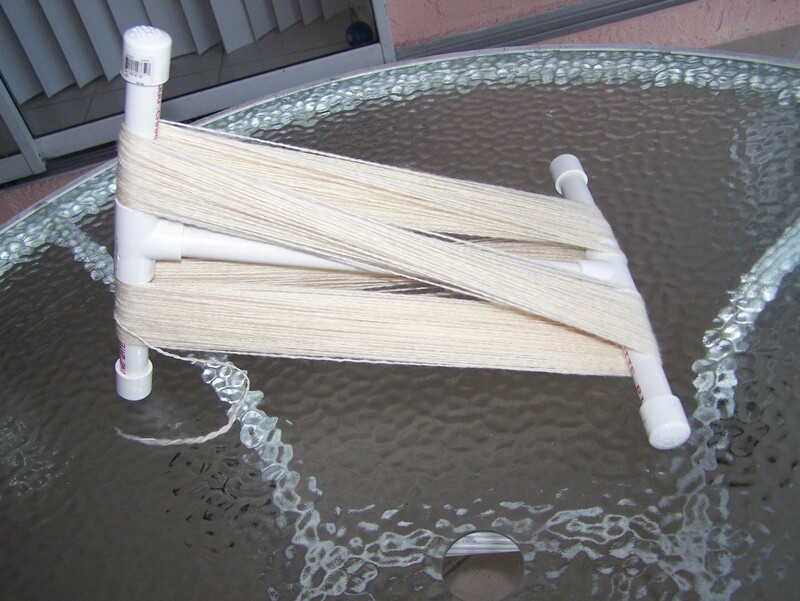 Once you have spun your initial wool into yarn, most will then ply it with another length of yarn to create a stronger and better looking yarn. 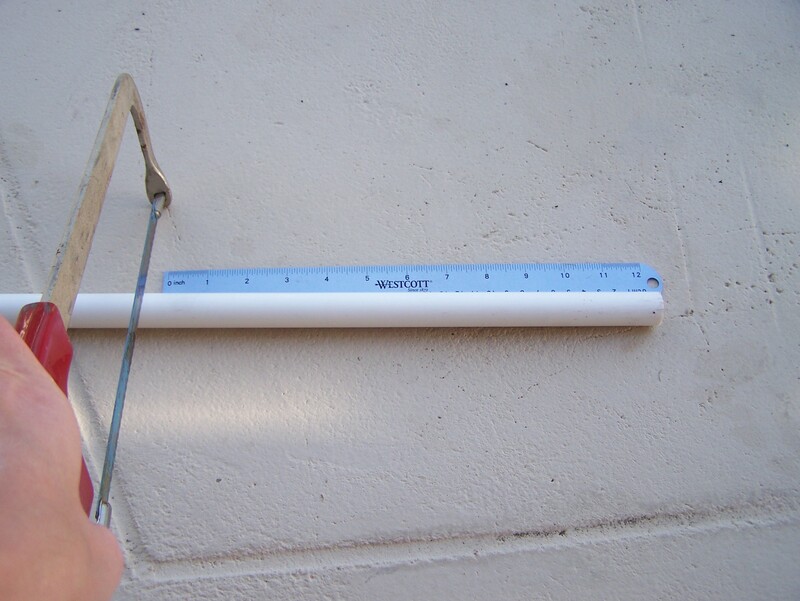 After that you will want to create a hank by winding your yarn onto a niddy noddy. 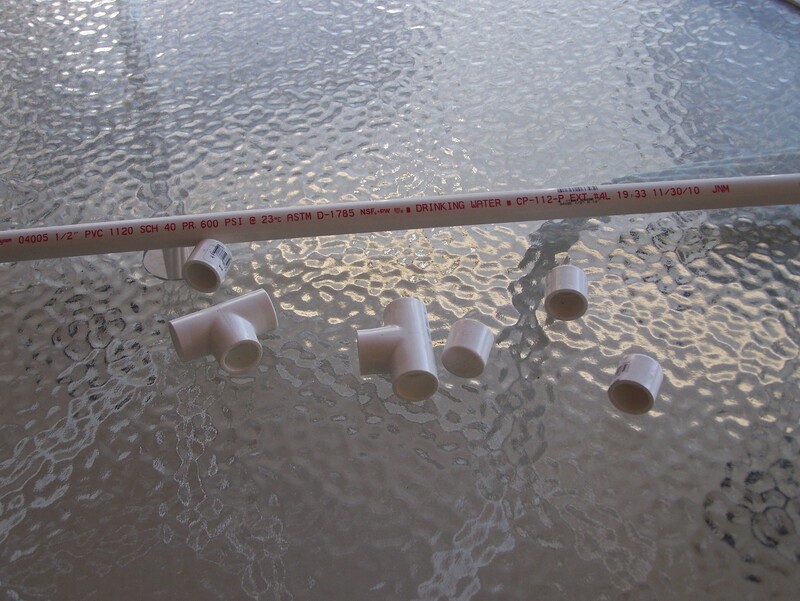 These can be made of wood or pvc and are found online in many spinning/knitting related stores. 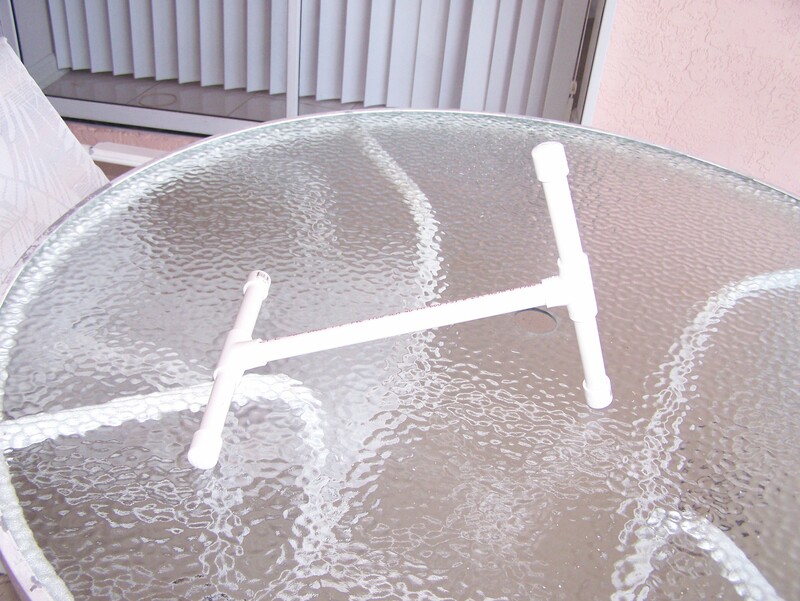 I decided to make my own out of hardward store pvc and this is how I did it. 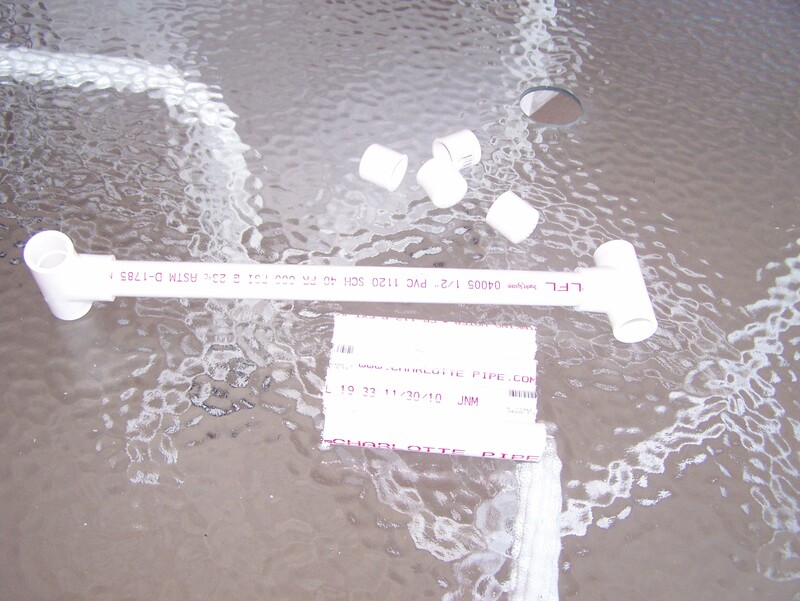 Either request that your pvc is cut into these pieces at the hardware store or cut them at home using an ordinary hand held saw. Place end caps on all four ends. Wind skein around niddy noddy and be happy! I just wanted to wish all my reader’s a very Merry Christmas. I’m sure by now you are surrounded by hand knit Christmas goodies to enjoy today and next year. Have fun and I hope Santa brings lots of yarn and fiber. It is said that there is an old German tradition to hide a pickle ornament on the Christmas tree. The first person to find it will receive good luck the rest of the year. There are American versions of the story as well although I hadn’t heard of the tradition until last year when all these pickle patterns began popping up. This is knitpick’s free downloadable pattern and maybe you’ll start a new tradition in your own house. I was looking for an ornament to post because chances are if you are looking for ideas at this point, you need a quick knit object. Then I came across this dodecahedron star (please don’t ever make me pronounce that). This does not appear to be a quick knit object, but it is truly unique. It doubles either as a tree topper or a stuffed animal. If you use different colors for each point, it would make a great baby toy! If you are still looking for knit ideas at this point, you are nearly out of time. Your best bet would be to stick with the ornaments because they are quick knit and often can be made out of small amounts of yarn already in your stash. Below is a cute little snowman. With short simple instructions, this can be whipped up in no time and will appear to have taken much more effort and time. This child’s elf hat is simpler to make but still very cute. It’s easy to make and great for Christmas outings. This is truly unique. There is a pattern for a quick knit holiday garland made out of a fun fur like yarn. Personally, I think this would look better with a more metallic fun fur, like silver with a little dark green thrown in, but it still looks remarkably good. I’m not sure how long it would hold up outdoors but it would be used indefinitely inside. Less than a week before Christmas! This is a knitted hat, made out of one of my favorite inexpensive yarns- Caron Simply Soft. The instructions are given for Newborn through ten years old. This is a great gift for the little reindeer lovers.